Continued pressure on Spotify from the giants – what future does the internet music streaming company has? Music streaming site, Spotify is now expanding at a furious pace to take the position as the world's largest service for streamed music. The Swedish company, however, faces intense challenge from the American giants like Google and Apple who have enormous resources and are already sitting on a gigantic user base. His follows the trend being observed today in which increasingly more music is being accesses through internet streaming rather than via downloading. This trend is said to continue in the future and these giants would not allow Spotify to remain the leader on that sector of the market. According to the trade organization IFPI 10 percent of the global music industry revenues in 2012 came from streaming services like Pandora, Spotify and Wimp. In Europe the proportion is twice as big, and it continues to grow. The driver of that growth is Swedish Spotify. In April, the company stepped for the first time in Asia and Latin America when the service was launched in Mexico, Hong Kong, Malaysia, and Singapore. The largest competitor is American Pandora, still dominates in the United States. The two companies are competing to rush to as many countries as possible. This means that the desire to achieve profitability at the moment has been side-lined in favour of revenue growth. Daniel Ek, founder and CEO of Spotify had insistent to Swedish media sources that his priority one, two, three, four and five was growth and he still stick to it. 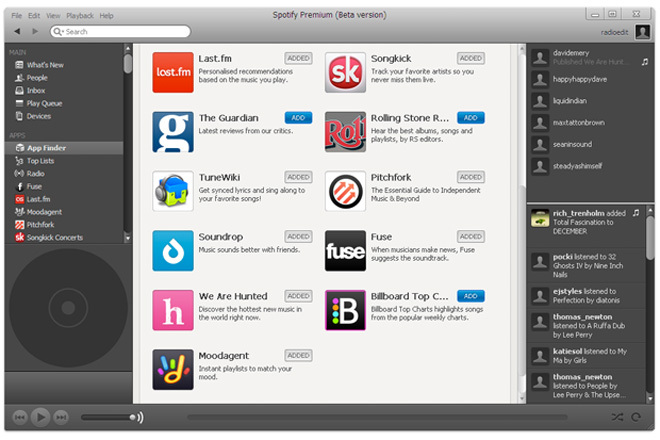 Behind the two industry leaders lurk smaller players like Slacker, Deezer, Rdio, Wimp and Sound cloud. The question now is if any of the pure music services will be winning the battle. Challenging are the two of the world's most powerful technology companies: Apple and Google. Google already has a large share of listeners through video streaming service YouTube, which in practice also works as a music player. According to sources close to the Financial Times, Youtube, which Google bought in 2006, is already working to develop a music service along the Spotify model. The idea is to offer both a free version with ads and pay version. Over 1 billion people today use Youtube every month. Apple's music service, iTunes Radio launched only in September but already is reported to boost 20 million users in its first five weeks. Itunes, which is Apple's software for download, streaming and playback of audio and video, has over half a billion users worldwide, which means that the potential market is huge. The service is so far mostly in the U.S. but will be launched in other English-speaking countries in early 2014.